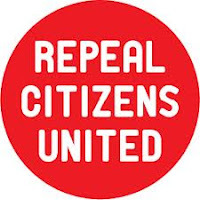 "There is a growing national movement to establish a 28th amendment to the constitution of the United States to address the issue of unlimited corporate spending in elections, although the groups working on the issue diverge on what exactly the amendment should say. One national coalition called Move to Amend (MTA) is led by David Cobb. A Green Party candidate for president in 2006, Cobb has been touring the country calling for a constitutional amendment to “clearly establish that money is not speech, a corporation is not a person, all corporations are subject to regulation, all campaign contributions will be disclosed, and (that) allows for no loopholes,” according to the MTA website. But passing a constitutional amendment is a daunting task, requiring the support of two-thirds of the U.S. House and Senate, followed by ratification by three-fourths of the 50 state legislatures. Cobb believes that it will take about 10 years to build a grassroots movement to successfully lobby for the enactment of the amendment, but that it can be accomplished eventually. “It’s a lot of work, but so was the Civil Rights Movement, so was women’s suffrage,” Cobb told IPS. “A small group of ruling elites has hijacked every one of the institutions in this country – the media and both political parties. There’s a corporatised culture and we have to change the power structure. The only way we see is to build a mass, multiracial movement,” he said. 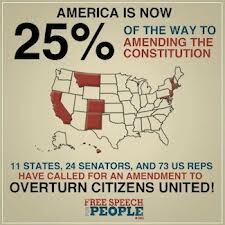 The effort to amend the U.S. constitution has in part been a reaction to the controversial ruling of the Supreme Court in Citizens United v. Federal Election Commission in 2010, which found that the first amendment to the U.S. constitution, on freedom of speech, prohibits the government from restricting independent political expenditures by corporations and unions. 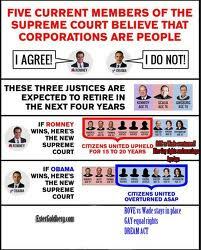 In the ruling, corporations were essentially viewed as having the same rights as people, thus coining the term corporate personhood. Data from the 2012 national elections have begun to reveal an unprecedented amount of spending in the elections, about six billion dollars, much of which is untraceable due to a new phenomenon called SuperPACs, political action committees that have literally no limit to how much they can spend, as well as shadow corporations, which are created for the sole purpose of funneling money into elections. One of the main organising strategies by MTA and other groups to support an eventual constitutional amendment is to get local councils and commissions at the city and county levels to adopt resolutions in support of such an amendment. According to the MTA website, there are at least 183 municipal government resolutions, 19 local ordinances, and three state-level resolutions in Hawaii, Montana, and Vermont that have passed to ban corporate personhood. In addition, there are 79 local resolutions and 10 state resolutions that have also passed, but that MTA considers partial resolutions because they do not completely address the issue of corporate constitutional rights. MTA is itself a coalition of hundreds of organisations, and MTA has dozens of affiliates in cities throughout the U.S.
Other organisations that are working on this issue nationally include United for the People, which is also a coalition and which also has affiliates; in addition to Free Speech for the People, People for the American Way, and Public Citizen. There has been some disagreement, though, among members of congress and various advocacy groups as to what the exact language of the constitutional amendment should be. 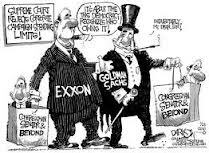 At least six different members of congress introduced legislation in 2011 to amend the constitution to in one way or another address the issue of unlimited corporate spending in U.S. elections. 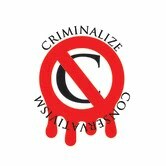 Meanwhile, different organisations are supporting different versions of the bill. For example, Free Speech for the People is supporting the Edwards proposal and the McGovern proposal. People for the American Way is supporting the Udall proposal. And Public Citizen is supporting the Deutch proposal, which is the counterpart in the House to the Sanders proposal in the Senate. Section 2 of the MTA version states, “Federal, State and local government shall regulate, limit, or prohibit contributions and expenditures, including a candidate’s own contributions and expenditures, for the purpose of influencing in any way the election of any candidate for public office or any ballot measure. Federal, State and local government shall require that any permissible contributions and expenditures be publicly disclosed. 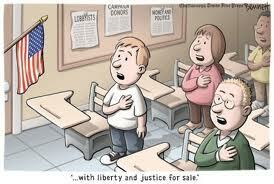 The judiciary shall not construe the spending of money to influence elections to be speech under the First Amendment. The Conservative War Against The Poor And Middle Class is backed by the Supreme Court Conservative capos and must be fought against in Congress, as well as by Constitutional challenges in court (though with the Court presently stacked the way it is, this may not be a great strategy - yet), and citizen activism in the streets. When the People are attacked by their own institutions, it is time to understand that crime can enter the political arena; it is time to realize that Conservatism must be made illegal for our democratic institutions to work the way our Founding Fathers intended.